Best View in Brooklyn: Artsy Mini-Golf in Industry City...Today! Artsy Mini-Golf in Industry City...Today! UPDATE: Here's what NY1 had to say. Does this count as a hipster event? If so, I think I might have hipster leanings despite pushing 40. 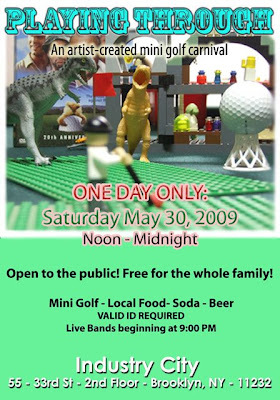 Today from NOON to midnight there is an indoor mini-golf event in Industry City. It's free (love it), there might be local food (the lovely woman who emailed me didn't sound 100%, but they were trying), and it's for the entire family. So all the hipsters who want to go aren't allowed to complain about the kids. Of course, there will also be beer, so I guess only the kids can complain about the poor playing others are doing. It's at 55 33rd Street on the 2nd Floor. This was fun but it was a little dirty for the toddler set. Some of the holes were downright impossible and others were borderline dangerous! There was one hole on a trampoline. I was there from 8:30 till midnight. I should say the turnout was very good.